Justin Bennett in residence at Overtoon, Brussels. 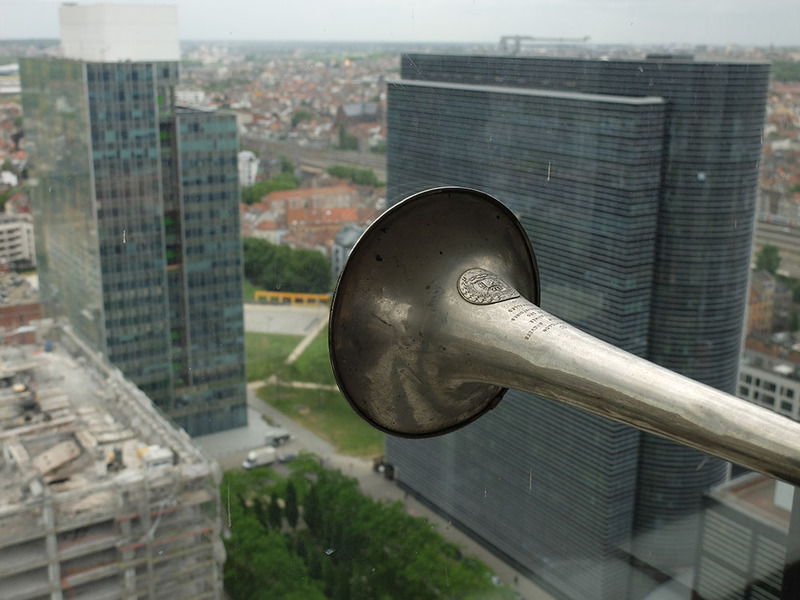 A research project investigating the acoustic territories of Brussels. Bennett is using the residency period to investigate the acoustic territories of the city of Brussels. Territories of language: voices, narratives. Territories of security: signals, announcements and sirens. Territories of work. Territories of birds and animals. Underground territories: the reverberations and resonances of the tunnels and passageways of the city. Firstly, Bennett is creating devices for active listening: A microphone inside a trumpet or a wooden stethoscope for example. These devices allow for the acoustic manipulation of sounds while listening and recording in a combination of listening, improvisation and field recording. Thirdly, visual and spatial forms of the city are explored in a series of drawings and sculptures. These three approaches intertwine and feedback within each other. The projected results are a sculptural installation to be presented first at iMal, Brussels opening 15/09/2017 and an audio work in public space to be presented early 2018.